Mayor Lucarelli of Fair Haven, NJ rides with students. This collection of stories highlights communities with fewer than 12,000 residents. Despite their small size, these places have put an emphasis on safety for youth walking and biking, making policies and changes that create better, liveable communities for all. 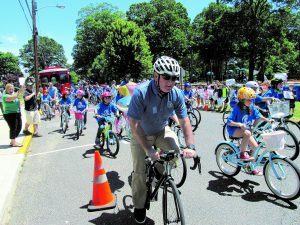 Fair Haven has been known as a bicycle and pedestrian friendly town, and the mayor has ensured the town continues to value walking and biking. The town continues to close a street connecting two schools in the downtown during arrival and dismissal, allowing children safe spaces to walk and bike to and from school. In addition, the mayor has been involved in adding bike lanes on county roads to create a loop around the town. He also helped contribute to the pedestrian friendly nature of the downtown with the addition of sidewalks and pedestrian-level lighting. In Hood River, OR several projects have contributed to safer biking and walking for the trip to school. These include the addition of crosswalks, changes to eliminate dangerous turns at intersections, and the installation of bike lanes. The mayor of Hood River, Paul Blackburn, has been an active participant in Walk and Bike to School Day events for many years and recognizes the benefits of supporting safe walking and biking for youth in the city. Being a smaller city with limited resources, the mayor highlighted that there are still opportunities for accomplishments, such as bicycle boulevards, that require little funding. Event days like Walk or Bike to School Day are also chances to both encourage walking and biking while drawing attention to the importance of safety. The town has relied on the community to support and help move forward initiatives for safe walking and biking. Allies have been important in reinforcing community values, and expertise among community members has contributed to applications for funding. All of these efforts derive from and support a focus for the community on exercise, ecology, and the economy. In Cushing, Oklahoma, a state highway in front of a high school caused concern for students who crossed throughout the day. As a response, a junior at the high school began a petition on change.org to improve safety at the crossing. With support from the board of commissioners of Cushing, the state installed a high visibility crosswalk and pedestrian-activated beacons. The safety improvements in Cushing started with the students’ cause and continued with support of the town’s board of commissioners. The mayor, a teacher at the local high school, encouraged the student to present her case in front of the board. Throughout the years, the mayor had become more involved with concerns for student safety by attending Walk to School Day events at the invitation of the school’s principal. These events had a two-fold effect. First, the mayor recognizes that an alliance between city leaders and the principal holds importance for meeting the needs of the community. Secondly, events help to rally the community together for the cause of children’s safety. In this case, with the mayor’s support, the community got behind a fix to improve safety for students walking near their high school. Hillsborough, North Carolina has been engaged in continuous work to connect all neighborhoods in the town, from one end to the other. This most notably includes a greenway, and a sidewalk that connects it to the downtown. The town has emphasized design for accessibility, ensuring that connections are open to residents and visitors of all means. Improving connectivity has provided safe, comfortable ways to access the downtown, as well as schools and parks. The long-term perspective has remained an important, guiding force for the mayor of Hillsborough in establishing a vision of what the community is and what it will be in the future. The mayor and town staff see a connected community as a benefit to community members of all ages. They believe in providing quality outdoor space as a means to encouraging people to leave their cars and enjoy the outdoors. A crucial element, in the view of Hillsborough’s mayor, is the ability to rely on planning staff as champions. Having city staff that have fully bought into the town’s vision helps to ensure that planning meets those goals. As an active participant in Walk to School Day events, the mayor also sees value in participating in community events. These opportunities to engage with the community, in the mayor’s words, help “make it real” by allowing the mayor to see how people move around in the community. After a mobility study that identified needs within the community, Miami Shores, Florida placed three neighborhood greenways near the only elementary school in the village in order to improve access and provide a safer walking and biking environment for students. Working with the Florida Department of Transportation, the village also installed a rectangular rapid flashing beacon to complete one of the greenways and allow for safer crossing at the school. The village worked to drive enthusiasm for biking and to encourage use of the new greenways through outreach that included neighborhood bike rides. In the future, there are hopes for speed limit reductions throughout the village. The mayor credits much of the village’s accomplishments to the ability to perform the mobility study and to a team of talented local residents. The mobility study drew attention from outside groups that helped when the village decided to act on the study’s findings. In the planning process, community members provided support with seeking out and applying for funding to implement plans. With these successes, the mayor sees the support of community members as a critical ingredient in making change, both in support of the village’s needs and also in encouraging elected official to be champions for walking and biking.